A phone call. That's all it took to shake me to my core. I didn't even get to talk to a real person but the message on the other end of the phone speared me through and through - "This is --- from --- I need to talk to you about your test results. Can you please call me as soon as possible?" I wasn't expected that call and I certainly wasn't expecting it to affect me the way it did. I had an honest to goodness meltdown and I didn't realize it until I was in the middle of it. We had been in the middle of eating dinner. I'd gone to my office to retrieve a book and saw the red light blinking on my desk phone indicating I had a message waiting. I picked up the receiver because I knew it would only take a second to hear the message and curiosity got the better of me. I wish I hadn't seen the red light. I walked back into the dining room and told my husband I'd received a call from the endocrinologist's office. They wanted me to call them back about my recent ultrasound. As soon as I said the word ultrasound, I began sobbing uncontrollably. My bewildered husband took me into his arms and held me tight. I bawled like a baby, deep guttural sobs. When I came up for air, I looked into my husband's eyes. He hadn't said a word. I told him I didn't think I could survive another bout with cancer. At that point, he understood my deep seated pain. He hadn't thought of that. He sat down and held his head in his hands and began to weep. We cried until we couldn't cry any more and we didn't even know what we were crying about. We hadn't received any real news yet, only a message to call back as soon as possible. Why did we immediately fear the worst first? As I thought about it, the only logical answer was cancer post traumatic stress disorder. Just like soldiers who'd been in the midst of battle were traumatized, so were we. Cancer does that. Cancer is hard...no, it's not hard, it's extremely difficult, more difficult than you can imagine. It takes a lot of resolve to fight cancer. It's indescribable. It took a while for both of us to calm down and get our minds off of the phone call. 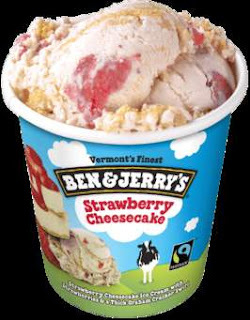 He was distracted with TV and I decided to down a pint of Ben and Jerry's Strawberry Cheesecake ice cream. Neither of us were really coping, but we did the best we could in the moment. Tomorrow morning, I'll be sitting by the phone to see if it rings. If it hasn't by mid morning, I'm going to place a call to the endocrinologist's office. I am afraid of what I'll hear but I'm hoping for good news. Maybe I'm just shell shocked. Maybe I'll get good news. I don't like PTSD. It sneaks up on you when you least expect it. It's like a slowly exploding grenade blossoming into oblivion growing stronger and more dangerous minute by minute. I don't know how to manage it right now and maybe I never will but I know if I keep on using ice cream as my coping mechanism, I'm going to weigh 300 pounds and then things are going to really get hairy. Thank you for taking time to comment. All comments will be reviewed for content before publication. Any comments with offensive language or content will be deleted. Oh energy, where are you? I'm a Christ follower diagnosed with breast cancer in 2014. This blog is the place I share my journey through cancer. Buckle up and come along for the ride! Cancer, you did not win! Journey Out of Pink by Bonnie Fouts Annis is licensed under a Creative Commons Attribution 4.0 International License. Based on a work at http://www.journeyoutofpink.com/. Permissions beyond the scope of this license may be available at http://www.journeyoutofpink.com/. I'm a breast cancer survivor!